Although at a glance North Harris appears almost completely devoid of native woodland, an exploration of gullies, crags and islands will reveal a number of native tree species clinging on in areas that sheep and deer cannot reach. The most common species is rowan, but there is also a scatter of aspen, holly and several species of willow, whilst birch and hazel are rare. It is clear from pollen analysis that woodland would once have been much more widespread in the Western Isles than it is now. However, due to the exposure to wind, salt spray, and predominance of wet peaty soils, the nature and extent of natural woodland would have been very different to that on the mainland. For example, the highest remnants of woodland on Harris occur at around 300m above sea level, whilst in the cairngorms trees will grow to an altitude of around 700-800m. 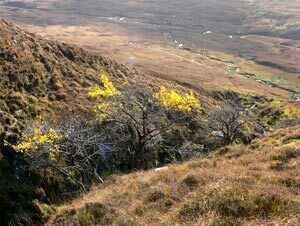 Native woodland has been identified as an LBAP (Local Biodiversity Action Plan) priority habitat for the Western Isles. 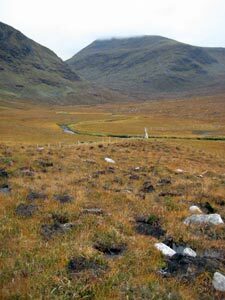 Three new native woodland schemes established on North Harris over the last decade have substantially increased the amount of woodland on the islands. In 2000-01 (prior to community ownership of the estate) an area comprising 100 ha was planted by the Ardvourlie Common Grazings committee. The success of this scheme provided much of the inspiration for the Trust’s subsequent projects. The trees are now over 10 years old and the area is already starting to look like a woodland. Following the purchase of the estate the Trust has been working to increase the amount of woodland on North Harris, with the aim of creating a network of woodland habitat across the estate. In 2007, 6 ha at Gleann Mhiabhaig and 12 ha at Gleann Langadal were planted. The scheme at Langadal is in quite a remote location, (4km from the nearest road) and proved to be a challenging project. Both of these schemes are making good progress towards successful establishment. The new plantations include tree species such as oak and Scots pine which no longer occur in the natural woodland remnants. However pollen analysis has shown that these species were once present on the Western Isles and they thrive in a similar climate on the west-coast mainland. On some loch sides where peat has been eroded away, substantial trunks of pine trees have been exposed as evidence that trees were once widespread in many areas. The Trust has identified a small but significant resource of remnant native woodland across the estate with the greatest concentration along the eastern boundary with Loch Seaforth. Therefore, where possible the aim will be to encourage regeneration around these areas of existing woodland, supplemented with planting in other areas where the soil is suitable for tree growth. The Trust is currently working on proposals for further projects with the aim being to collect seed locally in order to cultivate seedlings for planting.